Phillip K. Smith’s futuristic site-specific installations deal in light and shadow, reflection, form, colour, environment and change. 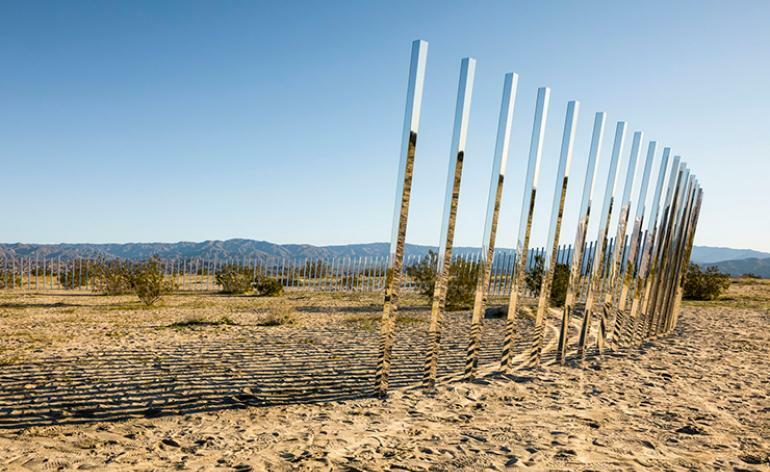 Raised in Palm Springs, with a studio in nearby Palm Desert his best known works are rooted in the Californian landscape: temporary installations such as Lucid Stead in Joshua Tree, “Reflection Field” and “Portals” at the Coachella Music and Arts Festival and “¼ Mile Arc” in Laguna Beach. This lecture at the Palm Springs Art Museum is a chance to hear about the artistic process and pick up his new monograph. Tiki styling meets serious architectural prowess at one of Palm Spring’s earliest condo complexes. Designed by Donald Wexler and Richard Harrision in 1960, it was recently designated as the city’s first residential ‘historic district’. Tropical foliage surrounds private units open for your perusal, including (back by popular demand) the home of resident homeowner and artist Shag. Highlights also include the west pool, which was completely restored with proceeds from last years ticket sales. Of late, Palm Springs Art Musuem is going through a self-induced metamorphosis, transforming from ‘a desert museum to a cultural hub’. Take a break from architecture and design with the Museum’s lively exhibition programme, which include a couple of high-hitting photography shows. Of particular note is ‘Having a Ball’, which spotlights a thorough selection of work from Interview Magazine’s Michael Childers, charting Andy Warhol’s Factory days. Then, head back in time with ‘Grass Roots: Native American Basketry of the West’, to explore the history of the area (before modernism popped up and proliferated) via its heritage crafts. Let’s twist again, like we did last summer, and the four before that. Back for its fifth iteration, the ‘Mod With a Twist’ event has become a hot ticket during Modernism Week. Famed for its amusing 10-minute talks programme, this year’s schedule features the mysteriously titled presentations ‘A is for Architecture’ by Kurt Cyr, and ‘ModWest’ by Richard Hovel, along with three other quick fire sessions that aim to replenish your energy for design rather than drain it (as a longer talk might). Expect punchy visuals and entertaining Q&As – don’t miss the ‘twist’. 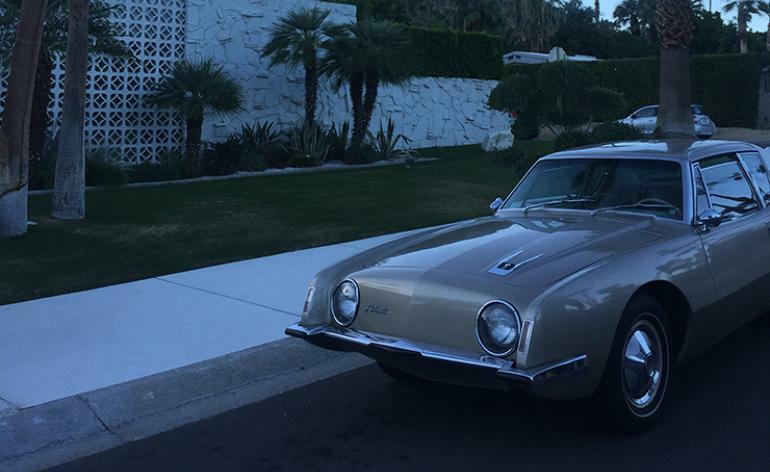 Vintage Alfa Romeo’s and Avanti automobiles – which were designed in Palm Springs by Raymond Loewy – will be on parade at the Modernism Week Vintage Car Show on 19 February. The show, located at the Palm Springs Convention Centre, presents over 50 specimens of vintage restored and original American and European cars dating from the 1940s to the 1970s. 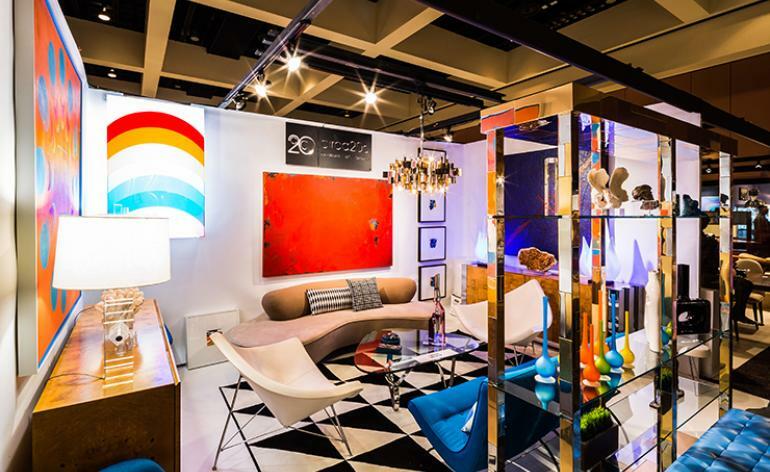 For 17 years, the Palm Springs Modernism Show & Sale has seen exhibitors from the US and Europe showing vintage furniture and lighting, including art, jewellery, textiles and clothing. New to the programme in 2018 is the Palm Springs Modern Design Expo, which will showcase modern design and technology for the home – from building materials, to appliances and unique mid-century style pieces. Located in the Old Las Palmas neighbourhood which developed in the late 1920s and 30s, Elizabeth Taylor’s former house is set across 1.5 acres and is now a popular wedding venue. The area is full of the homes of Hollywood stars including Kirk Douglas, Katherine Hepburn, Cary Grant, Judy Garland and Dinah Shore. 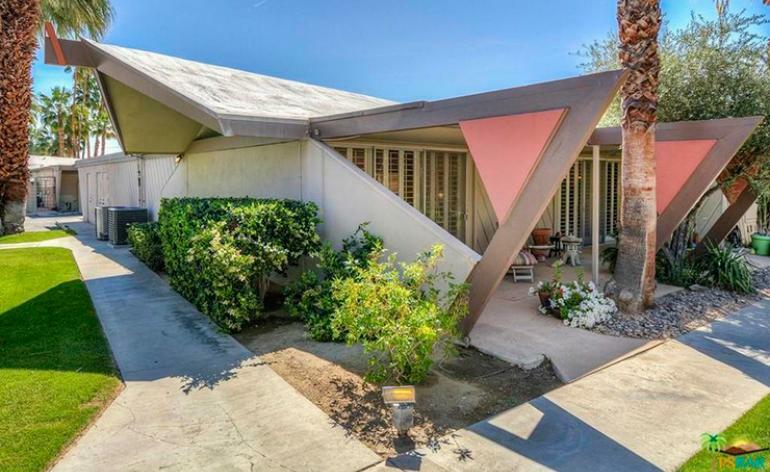 The Modernism Week tour ‘Golden Era Hollywood Homes in Old Las Palmas’ will give you a taste of the whole neighbourhood and its stories. 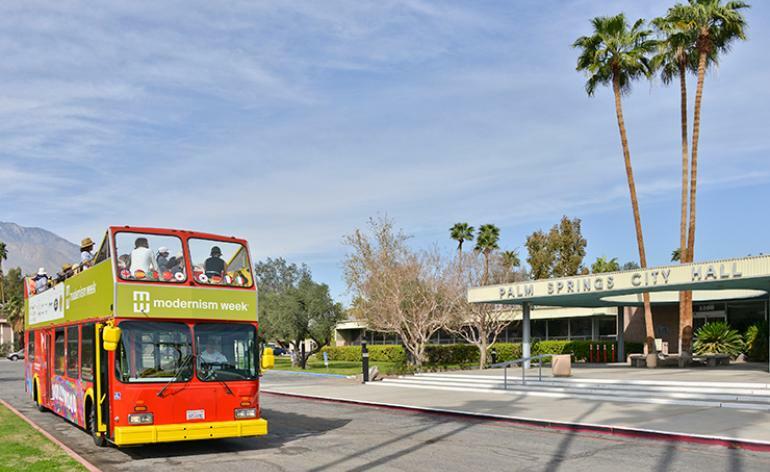 The double-decker architecture tour, a returning favourite to the Modernism Week programme, allows visitors to peek over the gates and hedges of houses in the exclusive neighbourhoods of Palm Springs. 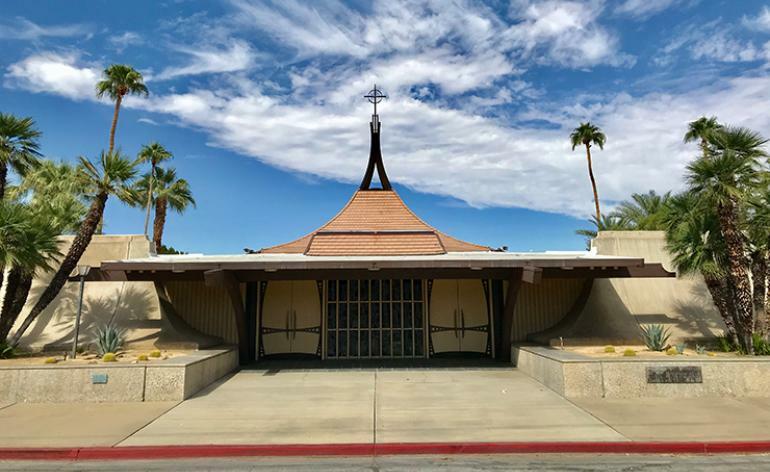 The tour, which weaves down the city’s main arteries and smaller streets, lasts approximately two-and-a-half hours, with highlights including the exploration of the mid-century ‘leisure lifestyle’ communities in South Palm Springs. Another sunset bus tour named ‘Illuminated Modern’ runs in the evenings, the local architecture illuminated with colourful lighting and projections. Meeting point is at the Palm Springs CAMP. 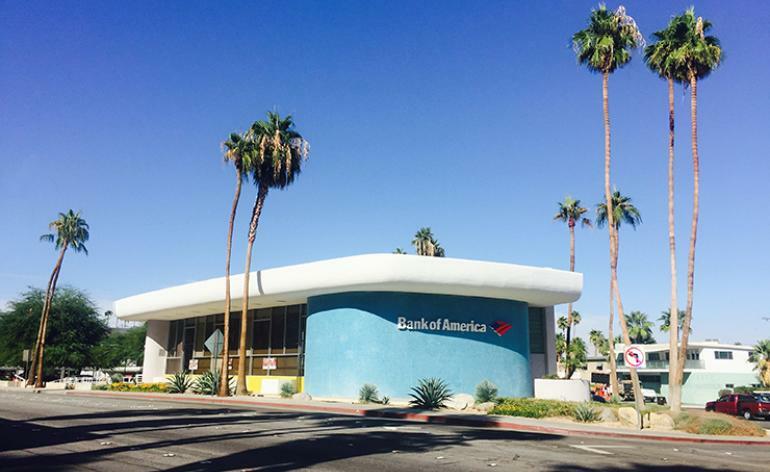 A beacon of civic mid-century moderism at the heart of Palm Springs is the Bank of America building, designed by Victor Gruen Associates and Rudy Baumfield (it was known as the City National Bank when it completed in 1959). Located on South Palm Canyon Drive, the building’s bold blue curved form was inspired by the shape of Le Corbusier’s Notre Dame du Haut chapel in Ronchamp, born of the booming Commercial Modern movement of the 1950s and 1960s that allowed architects to explore modernism on a larger, public scale. This tour examines the award-winning Temple Isaiah synagogue and contrasting modernist Liberman Chapel, designed by E Stewart Williams in 1949. 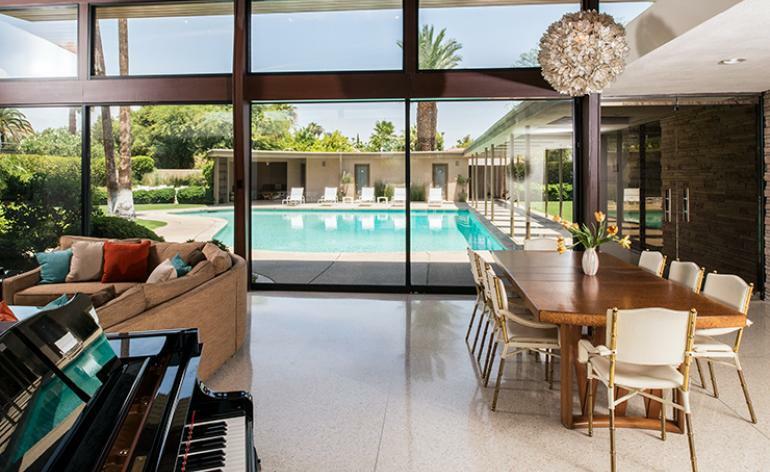 Aficionados may notice the former’s similarity with Frank Sinatra’s ‘Twin Palms’ home, which was completed by Williams in 1947, particularly the stone, wood, glass and plaster elements. 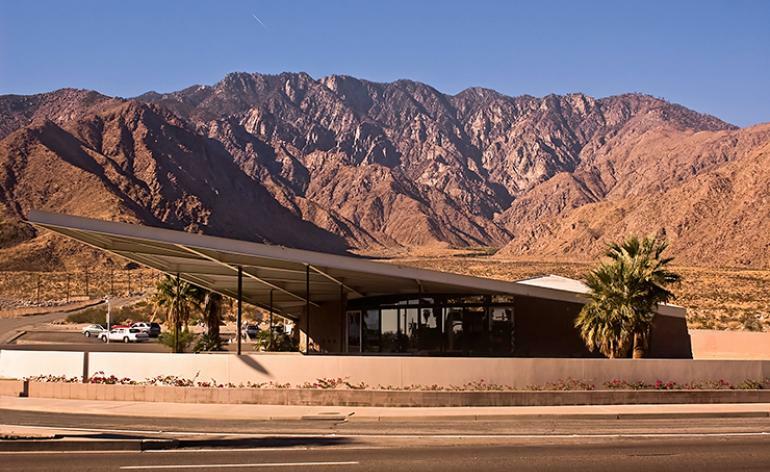 Also of interest on this Modernism Week tour is the 1980s west-facing addition by Donald Wexler and David Christian – which affords the congregation an incredible panoramic view of the San Jacinto Mountains. Multimedia presentations will reveal architectural drawings by the many talents who’ve contributed to this landmark building over the decades. Plotted here, the Saint Theresa Catholic Church, designed by William Cody in 1968 – at this stop on the tour, a documentary on its architect will play within the church on the day of the event. 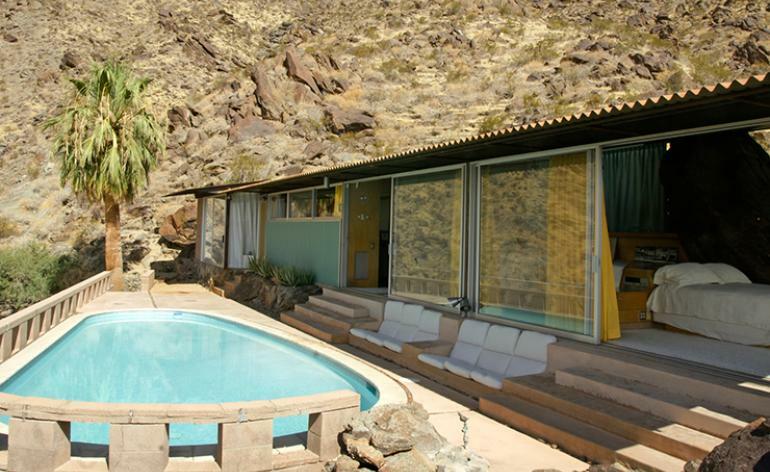 Raymond Loewy commissioned architect Albert Frey to design his Palm Springs home in 1946 on a rocky site overlooking Palm Springs. It was here that the industrial designer, developed the concepts of Air Force One, the Studebaker Avanti automobile, and the Exxon logo. Loewy influenced the design of transportation across America including the Greyhound bus and even NASA’s space capsules, as well as household items. As well as tours of the house, Modernism week presents a lecture titled ‘Raymond Loewy, Industrial Designer: What a Life! !’ at the Annenberg Theatre, which will unpack Loewy’s career and influence. 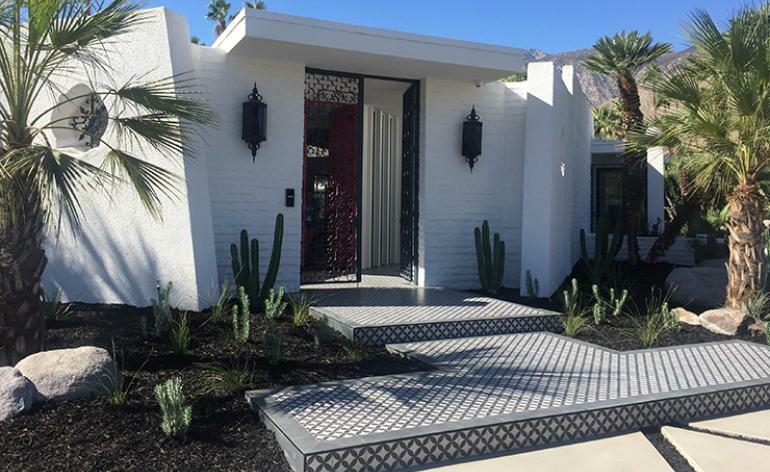 Tour a newly renovated Modernism Week ‘showcase home’ that combines modernism with Moroccan style. The original house, designed by architect Hal Lacy and built in 1975, has been renovated by DeeAnn McCoy and Jackie Thomas of Thomboy Properties. The pair have injected the colourful and luxurious interiors with hints of North African design. The modernist home is like a riad: its 10ft high, custom-carved double entry doors open into a paradise of smooth levels, clean lines and colourful interiors. Its white outer wall, that encloses a pool, garden and terrace, creates a cool cocoon of privacy with added decorative moments such as medallion cutouts and metal screens. 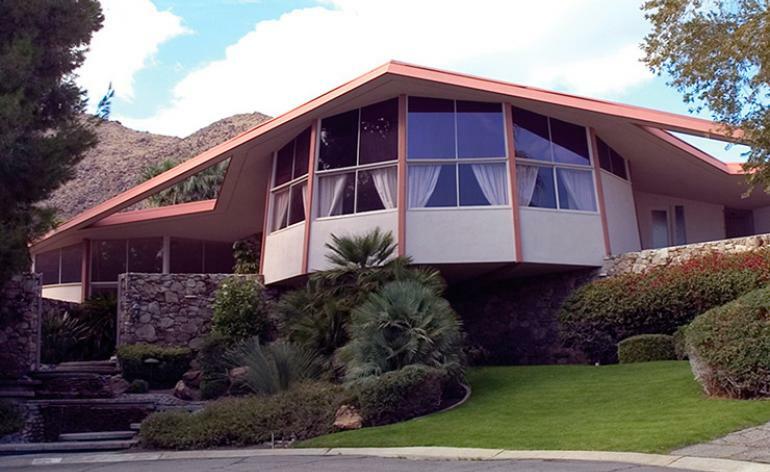 From 1966-67, Elvis and Priscilla Presley lived in Palm Springs at the Honeymoon Hideaway, nicknamed after the couple visited the house for their honeymoon in May 1967. The story goes that Elvis lifted Priscilla over the threshold Hollywood style. Perhaps not surprisingly, their daughter Lisa Marie Presley was born nine months later... The House of Tomorrow – its original nickname – was built in 1960 by well-known developer Robert Alexander for his wife, Helene. The 5,000 sq ft house was their dream home, built in four circles on three levels with four bedrooms and five bathrooms. Nestled into the side of the San Jacinto mountains – with views across the Coachella valley – is Frey House II, designed by architect Albert Frey. 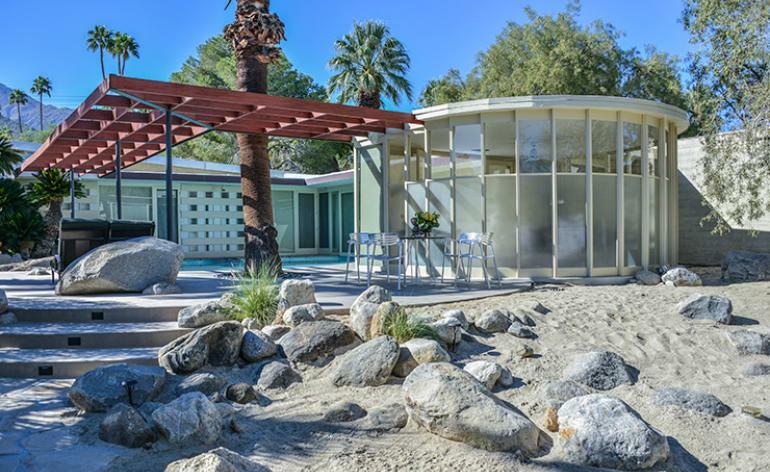 Palm Springs Modernism Week presents an opportunity to explore the house, which was Frey’s second home in the town. 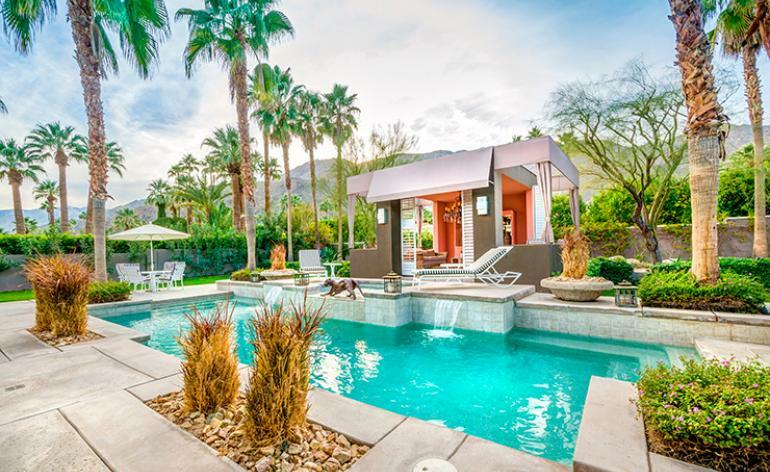 It is compact – approximately 800 sq ft – and very private, with a curved pool and patio sunk into the rocky surroundings. 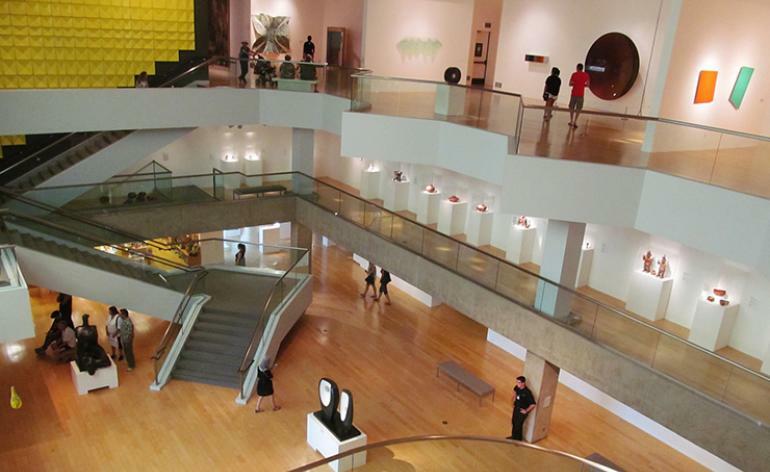 The 45-minute tour, hosted by Palm Springs Art Museum’s Architecture and Design Council, aims to afford a sensitive insight into the architect and his architecture. 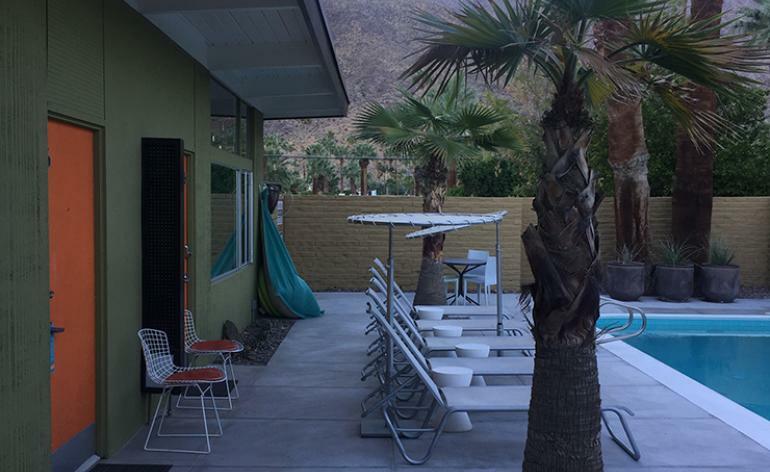 The Palm Springs Historical Society presents a tour of the Movie Colony, a tranquil neighbourhood developed in the 1930s and 40s, which was home to stars such as as Cary Grant, Dinah Shore, Van Johnson, Tony Curtis, Gloria Swanson, and Jack Benny. Frank Sinatra moved into Twin Palms in the 1950s, a home located at the heart of the neighbourhood – bringing the life and soul of the party with him. The tour reveals many more residences of Hollywood’s royalty – one of the estates was even named the Desert Royal Palace because of the propensity of royal guests from Europe and Hollywood stars.